Sometimes you just feel, originally uploaded by xperimentl. Getting over the flu. Nasty cough is lingering. 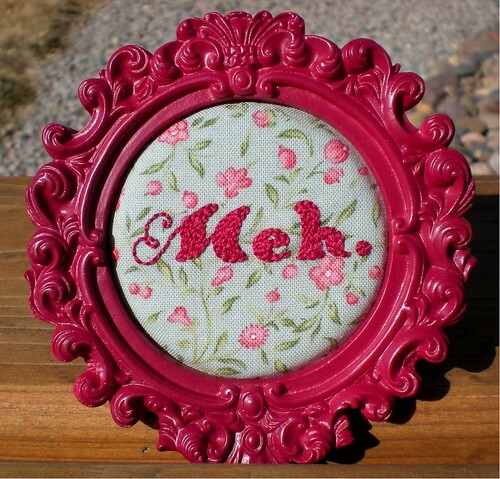 Seeing this in the Embroidery Flickr pool was a pick-me-up though. And the frame makes it quite special! That is really great. Hope you feel better soon. That is so cute. Any chance you have a pattern? I'd love to make this for my friend, he's having a bad month (already!). Haha, that's awesome. Those stitches are gorgeous too! It is amazingly beautiful and ornate which makes the "meh." so much more awesome. Hope you feel better soon, just want to say I love your blog! I have a friend that says that all the time. I'll have to do one for her. It's very pretty! Thanks for all of the great feedback on this piece. I was feeling "meh", but just a simple font and frame wouldn't do. I don't have a pattern, just typed it out in AnAkronism font (free) and backstitched it up. Thank you for letting us know a wee bit about the piece. That is a most excellent font! This is just so wonderful! Love it! I feel Meh right now, but your blog photos are making me happier :) Get better soon. March Stitch Along - the final post!